Portable pool tables are a great way to save space, take the game on the go, and introduce pool to younger players. Portable pool tables are a good choice for people who want to have a pool table but can’t dedicate an entire room to it. They come in many different sizes and are generally very easy to assemble. Usually, they’re made of a combination of laminated woods and artificial materials. The best thing about them is that after you have finished playing, you can store them away in a matter of minutes. The best portable pool tables should feature quality materials and construction, easy assembly, and easy storage. A 6-foot table with modern styling, sturdy construction, easy-assembly and premium features. Also, you can take your portable pool table outside and set it up in the backyard for a quick outdoor game of billiards. Just like their full-sized counterparts, portable pool tables offer countless hours of fun. There is a huge variety of options out there and it can be quite difficult to narrow down your choices. They start at around $70-$80 and can fetch up to $500-$600. 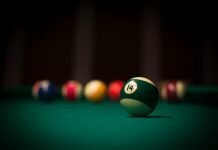 The following are four of the best portable pool tables. These models range from super affordable to middle/upper price range. The 55” Folding Pool Table by HLC is the first item on the list. This folding portable pool table is 55” long, 29” wide, and 31.5” tall. It weighs 42.8 lbs. With legs detached, table is only 2.75” tall and can easily be tucked away beneath a bed or other furniture. This model requires basic assembly. When it arrives, you will have to attach the legs and pocket nets. After that, you can use this table like a regular folding pool table. Along with the table, you will get a set of fifteen numbered balls, one cue ball, two cues, one plastic racking triangle, two chalk cubes, and one brush. The balls are somewhat smaller and lighter than the regular ones, measuring 1-1/2” in diameter. For a super-affordable table, HLC’s 55” Folding Pool Table offers excellent playability and will give you good bang for your buck. That being said, bear in mind that this is one of the cheapest 55” tables and that it’s far from perfect. 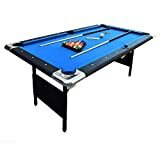 The HLC 55” Folding Pool Table is the most affordable model on this list and one of the best portable pool tables in its price class. If you’re on a tight budget, this might be the right one for you. The Bello Games New York Deluxe Folding Pool Table is an upper-intermediate class model. The table sports classic styling, with dark brown sides and a green wool cloth playing surface. This folding pool table is 44” long, 24” wide, and 30” tall. The playing surface is 4-1/2” deep. The table arrives with the legs and pocket nets already attached, requiring zero assembly. The legs fold underneath the table for easy storage. Due to its compact size, the table fits under a bed as well as in a closet. Together with the table, you will get a set of 16 balls, two 42” cues, one brush, one racking triangle, and chalk. The balls measure 1-1/2” in diameter, which is the appropriate size for a 44” table. This Bello Games table offers a lot of fun and is great for recreational players. However, despite its price it might not be a good choice for players who expect it to offer the same experience as a full-sized table. This Bello Games New York’s model is one of the most expensive items on this list. It is a great choice for players who want a quality table but have limited space at their disposal. The Costzon Foldable Pool Table is another budget option. This affordable set offers a classic pool table on a smaller scale and with dark sides and green nylon cloth over a durable MDF playing field. The table is 47” long, 25” wide, and 27” tall. The table comes fully assembled, ready to play right out of the box. When you are done, loosen the legs a little bit and fold them beneath the table. You can store this table under furniture, in a closet, or against the wall. You will get all the standard accessories along with the table. 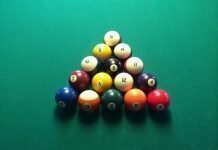 These include a set of 16 balls (slightly smaller than the standard pool balls), black plastic racking triangle, pair of two-piece cues, two chalk cubes, and one brush. The balls are nicely weighted and made of durable resin. The Costzon table offers good play-ability for its price class and is great for beginners. Standing 27” tall, it is somewhat lower than a regulation table. This makes it great for kids, as well as adult players. Costzon’s Foldable Pool Table is another inexpensive option. It is great if you are looking for a compact table with an elegant design. Hathaway Fairmont’s 6ft Portable Pool Table is the most expensive item on this list and has the performance to match. It is a foldable table with modern styling and reinforced construction. The table is 76” long, 43.25” wide, and 32” tall when assembled. The playing field measures 66” in length and 33” in width. Like the compact Costzon model, this 6’ Hathaway Fairmont comes fully assembled. When you want to play, unfold the legs and you’re ready to go. When the session is over, fold the legs and store the table away. Along with the table, the package includes a pair of two-piece cues (48”), set of 16 standard-sized balls (2.25” in diameter), two chalk cubes, one table brush, and one racking triangle. Premium features include L-profile cushions, chrome-plated corner casings, integrated leg levelers, and blended wool felt. It also comes with a 180-day manufacturer’s warranty. With a 6’ playing field, this portable Hathaway model requires considerably more space than the other models on this list. It offers fantastic playability and build quality. The only major drawback might be that the full-sized balls are a bit too big for a 6’ playing field. The Hathaway Fairmont 6ft Portable Pool Table is the most expensive model on this list. It’s a great option for people who don’t mind spending a few extra dollars on a top quality product. 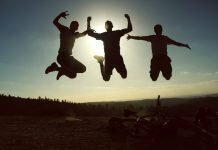 First, you will have to determine how much you are willing to spend. As mentioned, portable pool tables start at around $70-$80 and can go up to $400/$500. The most expensive models can even come close to the $600 mark. Usually, the more expensive models come with more bells and whistles, while the affordable ones tend to focus on the essential features. The size of the table, quality of materials, workmanship, playability, ease of use, included accessories, and special features all play a role in a table’s price. Portable tables start at around 40” (length) and can get as big as some smaller and medium-sized regulation tables. When choosing the size of the table, you should consider how much space you have available. You should have at least 4’-5’ of free space on each side of the table. It goes without saying that the bigger tables will offer a closer playing experience to full-sized regulation tables. On the other side, smaller tables are lighter and easier to store and assemble/disassemble. Construction-wise, portable tables are far lighter than their full-sized brethren, and are also made of less expensive materials. MDF (medium-density fiberboard) is the most common playing surface material. Nevertheless, the best portable pool tables are sturdy and durable. The legs are most commonly made of wood (MDF) or metal. They come in two main variants – folding and detachable. Tables with folding legs require no assembly and are usually ready to play straight out of the box. On the other side, models with detachable legs should take no more than several minutes to assemble. Regardless of the style, always check if the legs come with levelers. Portable pool table sets should come with all the accessories needed for a regular game of pool. A standard set of accessories includes 15 numbered balls, one cue ball, two cue sticks, one brush, one racking triangle, and one or two cubes of chalk. Some fancier models might also include cue holders on the sides, chrome-plated details, or position markers on the rails. These tables are easy and fun to play. The best have properly sized and weighted balls for the table, quality cues, and properly sized pockets. The playing surface must be flat, even, and made of quality materials. That being said, you should not expect a portable table pool to behave the same way as a full-sized table. 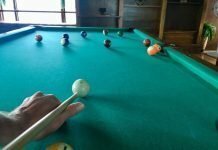 Some of the most common reasons are that portable tables have slower bumpers, smaller balls, shorter cue sticks, and lower-grade playing surfaces than full-sized tables. Also, portable tables are usually shorter than standard tables. 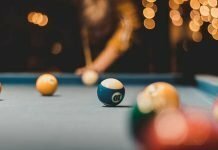 When buying a portable pool table, consider your budget, space limitations, and what you expect to get out of your purchase. 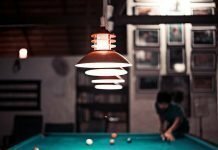 Do your research on as many options as you can and then choose the best portable pool table for you.